Two camels were on the loose in Green Valley Monday night. 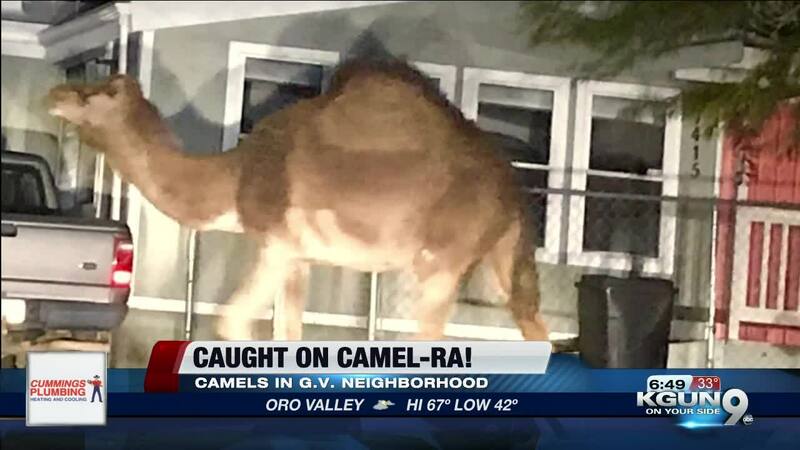 TUCSON, Ariz. - Two camels were on the loose in Green Valley Monday night. The Pima County Sheriff's Department said they got a call around 7 p.m. of two camels running loose in a neighborhood. Two camels were spotted roaming a Green Valley neighborhood tonight. They sent deputies to South Avenida Kaye, where they found two camels in front of a home. Deputies tried contacting the owner, but the owner was in the hospital. There was supposed to be a care taker for the animals. Officials say, there is a welfare check on the animals. Deputies are still investigating the situation. No word from authorities on how the camels escaped or from where they escaped. The owner is back home along with the animals.